BARCELONA, Spain (AP) Mercedes got the commanding victory it had been seeking all season. Lewis Hamilton put on a strong performance at the Spanish Grand Prix on Sunday, showing his team was back in business after a struggling start to 2018. It was the first time Mercedes showed the type of dominance many fans had grown used to seeing from the Silver Arrows in recent years. And it was the type of victory that could reassert the team’s authority in Formula One. ”That was a great result but there was no point where it felt as comfortable as it might have looked from outside,” Mercedes chief Toto Wolff said. ”It feels like a long time since we had a 1-2 finish, so there’s definitely a measure of relief in how we asserted ourselves. Valtteri Bottas was second on Sunday to cap a nearly perfect weekend for the Mercedes drivers, who set the fastest times in practice and qualifying before Hamilton ultimately cruised to victory at the Circuit de Barcelona-Catalunya. It was the first time this season Mercedes finished 1-2, and also the first it locked the front row in qualifying. Coming off four straight titles in both the constructors’ and drivers’ championships, Mercedes had started the season by showing good pace in Australia, although it let victory escape thanks in part to an ill-timed safety car that helped Ferrari’s Sebastian Vettel earn the win in Melbourne. 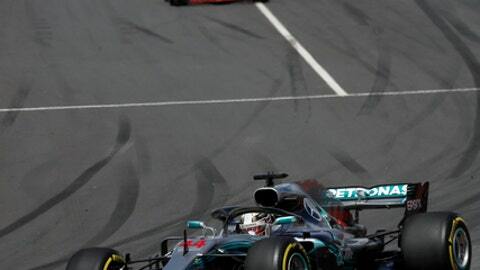 Mercedes only struggled after that, being outrun by Ferrari in Bahrain, China and Azerbaijan, where Hamilton won for the first time this season after his closest competitors ran into trouble in front of him. The Circuit de Barcelona-Catalunya was a track where Mercedes was expected to run well, but the next race is in Monaco, where the team has struggled in recent years. The street circuit demands setups that work well on slow corners, traditionally a strength for Ferrari and Red Bull. ”We will savor the result, but our thoughts are already turning to Monaco, to the struggles we had there last year and to how we can make sure not to suffer a repeat,” Wolff said. Vettel won the Monaco race last year, when Ferrari was 1-2 in qualifying and in the GP. Bottas finished fourth and Hamilton was seventh. Despite the early problems this season, Mercedes will arrive in Monaco with Hamilton leading the drivers’ standings by 17 points over Vettel. The team has a 27-point lead over Ferrari in the constructors’ championship.